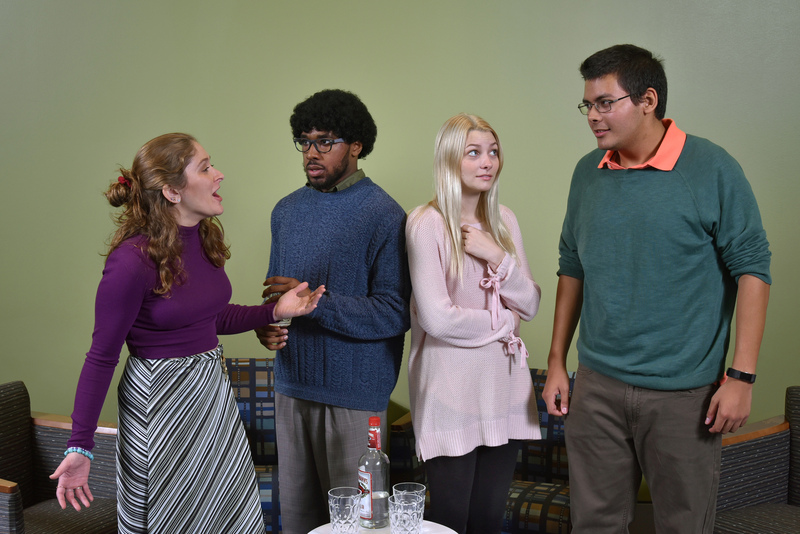 OSWEGO – “The Shape of Things,” a four-character Neil LaBute play about making personal changes to satisfy one’s partner in a relationship, will open at 7:30 p.m. Wednesday (Nov. 7) with a preview performance at Waterman Theatre in SUNY Oswego’s Tyler Hall. The play will run Nov. 8 to 11, with matinees the last two of those days. Student actors serving as understudies (from left) Michaela Buckley (as Evelyn), Trey Thomas (Adam), Mackenzie VanHorn (Jenny) and Philip Jones (Phillip) prepare as avidly as the leads for the theatre department’s fall production, and will all get to take the stage during the run. Tickets for the preview are $5 (free for SUNY Oswego students); tickets during the run are $15 ($7 for SUNY Oswego students), available through box offices, tickets.oswego.edu or 315-312-3073.